In his experiments for food preservation, Dr. Griffin has just made an incredible discovery. There is a formula, entailing taking a combination of monocane and other chemicals, which can make a human being invisible. The excitement is so big to cloud his judgement. He leaves his boss, Dr. Cranley, Cranley’s beautiful daughter, Flora, and his friend Dr. Arthur Kemp and complete the experiments in solitude and unnoticed. He eventually tests the formula on himself and becomes The Invisible Man. There is a major drawback though, he doesn’t know how to reverse the process. 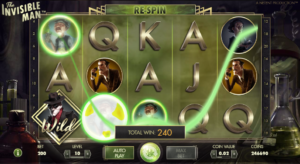 NetEnt™ together with Universal Studios presents a stunning branded game, filled with amazing features and delivering all the excitement and thrill of a hunt to the character played by Claude Rains in the 1933 homonymous movie. 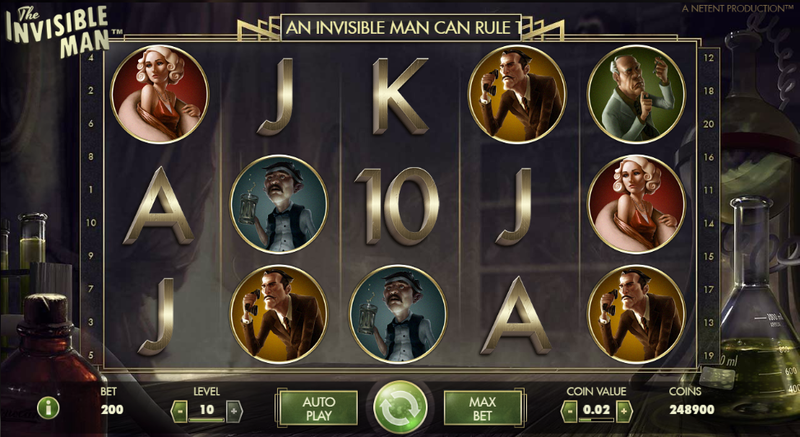 The Invisible Man™ is a 5-reel, 3-row, 20-line (fixed) win-both-ways, 10-level video slot with Re-Spins, Free Spins, Wild substitutions, Walking Wilds and 2 Bonus Features. The Police Wild appears on reel 1 and moves 1 place to the right on the reels with each Re-Spin. The Griffin Wild appears on reel 5 and moves 1 place to the left on the reels with each Re-Spin. 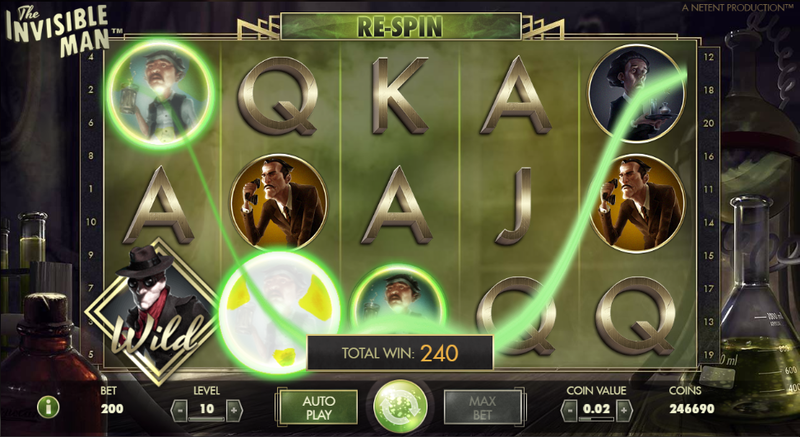 Wilds can appear on any reel during free spins and they can substitute for any other symbol. A Police Wild and a Griffin Wild merging together on the reels trigger 10 Free Spins, or 4 additional free spins if you are already in a Free Spins mode. During free spins, 2 meters with 8 spaces each appear above the reels. The meters correspond to the wilds that appear during free spins. When a Policeman or a Griffin move off the reels, 1 space is filled on the corresponding meter. If during the Free Spins mode one of the meters is filled, a bonus game will start at the end of the Free Spin rounds. The 2 bonus games are the Police Spin feature and the Griffin’s Rage Bonus Game. The Police Spin feature consists of 3 spins with 5 random wilds appearing on the reels. The Griffin’s Rage Bonus Game is a hunt to the Invisible Man taking place in 3 different locations. Player has to click on 1 of 5 items to pick the corresponding prize. 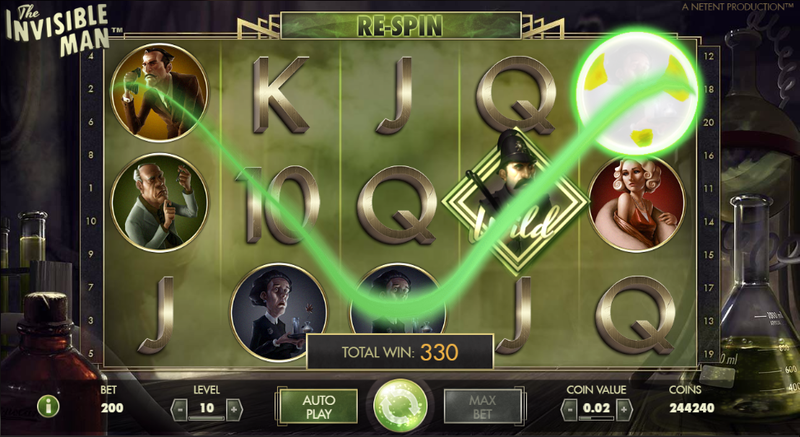 When the player picks a coin, it is added to his running coins total for the Bonus Game and player can choose another item in the same location. The multiplier increases by 1 at any pick, and can reach a maximum of X4. 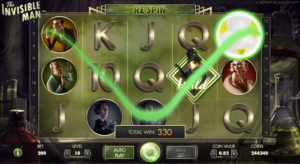 The total win in the Bonus Game will be given by the total coins amount multiplied by the reached multiplier. This game is also available on Mobile! Play The Invisible Man For Free Now!